All of our training courses and programs are "hands-on", and are offered at the client's facility (on-site), anywhere in the world. This course provides an in-depth understanding of how to plan, design, conduct and analyze experiments (DOE). It starts with basic single-factor designs, and includes factorial, screening design, Plackett-Burman, fractional factorials, and finally Taguchi's Orthogonal Arrays. This comprehensive course teaches you the concepts, as well as interpretation and analysis of your experimental data. All examples are based on industrial applications by the author. Once you learn the DOE concepts presented in our step-by-step logical approach, you will be able to use any software package. Demonstrations will be done using Minitab®. Design of experiments is a must for individuals involved in all aspects of product and process development, characterization and optimization. Duration: Typically 3 to 4 days. We take participants through lectures in which they learn the tools, methods, and concepts. Then, we help them to apply the tools to their own processes. 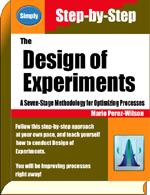 This is, by far, the most efficient way to learn design of experiments.